India’s interference in the Nepali constitutional process has tarnished Narendra Modi’s reputation in the Himalayan country. An objective analysis shows that despite the hype, the ruling Bharatiya Janata Party’s foreign policy initiatives are not yielding the desired results, at least in India’s neighborhood. 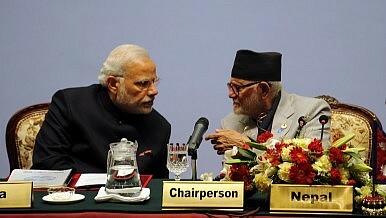 India also seems to have hit a wall in its relationship with Nepal. This seems especially true if one considers India’s response to the adoption of the Himalayan republic’s brand-new constitution. Not only did Kathmandu’s ruling elites ignore New Delhi’s advice while promulgating the new constitution; they also snubbed India by adopting the document despite objections from its “big brother” to the south. …deeply disappointed with the three major parties’ failure to take on board the broader sections of the Nepali population. But Delhi would do well not to be seen as crossing the red line to meet its objective. It could box itself in a difficult position and see it lose its diplomatic leverage against certain parties and sections of the polarized society. At least 40 people are reported to have lost their lives in Southern Nepal in an ongoing, month-long protest against the new constitution. The Madhesi, an ethnic minority living in the Terai region which borders the Indian states of Bihar and Uttar Pradesh, feel particularly disappointed. This group has historically been marginalized, and feels that the new constitution fails to give them promised political participation. A large section of the Nepali population holds India responsible for stoking dissatisfaction amongst the Terai populace. “First of all, it has to be acknowledged that this constitution has left a large segment of Nepali population feeling discriminated against, including the Jananatis (indigenous people), Madhesis, Dalits and women,” says Mallika Shakya of the New Delhi-based South Asian University (SAU). But the fact of the matter is that New Delhi appears to be playing a partisan game in its northern neighbor, thereby exposing itself to charges of inciting division in the predominantly Hindu state. This could potentially damage New Delhi’s reputation, both in Nepal and further abroad. Not long ago, India played a constructive role in bringing the Maoist insurgent movement to mainstream politics in Kathmandu and ushering in a new era of democracy in Nepal. When Modi visited Nepal last year he was given a rousing reception, cutting across ethnic and religious fault lines. Today, however, the Indian prime minister has become a polarizing figure. On social media, the hashtag #BackOffIndia has been trending for the last few days, with more than 20,000 tweets posted so far. Thousands of tweets are addressed directly to Modi’s accounts, asking him very bluntly not to interfere in Nepal’s internal affairs and respect its sovereignty. India runs the risk of being perceived as an ally of reactionary forces in Nepal if it does not tread cautiously. By its meddling in the constitution process, it has given the political elites in Kathmandu an opportunity to divert people’s attention from the actual shortcomings of the constitutional document. There is little doubt that the the Nepal episode has brought to question Modi’s much touted “neighborhood first” policy. Sometimes being a rockstar just isn’t enough.